Lt. Gov. John Fetterman, center, along with state Rep. Rich Irvin, left, and Huntingdon County Commissioner Jeff Thomas heard viewpoints regarding the possible legalization of recreational marijuana Wednesday night at Juniata College as part of a statewide listening tour. Alumni Hall in the Brumbaugh Academic Center at Juniata College was nearly filled Wednesday night as many turned out to participate in Lt. Gov. John Fetterman’s local stop on his statewide listening tour to gain input on the possible legalization of recreational marijuana. Fetterman introduced state Rep. Rich Irvin and Huntingdon County Commissioner Jeff Thomas, who participated in the listening tour event along with the lieutenant governor to hear from their constituents. The format of the event was simple, straight-forward and informal. Microphones were set up at the base of the auditorium’s two aisles and participants were free to form lines and state their thoughts freely as the state and local leaders listened attentively. Those who wanted to weigh in on the subject without speaking up publicly were afforded the opportunity to fill out comment cards and submit them privately. Huntingdon County’s listening tour event garnered public commentary from more than 40 individuals, both for and against the legalization of recreational cannabis use, including impassioned pleas and well-researched arguments from those on either side of the issue. Arguments against the possible legalization cited negative impacts to the family, the potential for an increase in impaired driving and workplace accidents and the potential for an open door to escalating drug use. Many added that the marijuana currently sold in the United States is “not your grandmother’s weed” and has been genetically modified to be more potent and potentially dangerous. Those who stated the case for Pennsylvania to follow in the footsteps of Colorado, Washington, Oregon, California, Nevada, Alaska, Vermont, Michigan, Massachusetts, Maine and Washington, D.C., compared current laws regarding marijuana use to the prohibition of alcohol during the 1920s, touted the benefits of increased tax revenue and cited the disproportionate rate at which minorities are arrested for marijuana-related charges. Fetterman observed that the listening tour stops thus far have taken on a very similar tone. While the decision to make stops in each of the state’s 67 counties is labor intensive, Fetterman said the issue is too important to allow for a superficial poll of public opinion. He praised the public officials who took the time to attend and participate in the event. This listening tour will conclude in late May or early June. The state Department of State released information this week that indicated counties across the state are transitioning to new voting systems with a paper trail, just as state Rep. Rich Irvin has introduced legislation that would exempt electronic voting systems that already have paper trails from the mandatory voting system update. According to a press release from the state Department of State, 19 counties have taken official action to acquire new voting systems, 52 counties are in the process of implementing the systems this year or by the 2020 primary election. Counties are required to choose voting systems by Dec. 31 and implement them by the 2020 primary election. So, where is Huntingdon County in this process? According to the county commissioners, the current voting machines in the county, which do have a corresponding paper ballots, have not been decertified, but they want to do as much research as possible. “We’re doing our due diligence and working toward it, but we’re currently in no position to purchase new voting machines,” said board of commissioners’ chair Mark Sather. “We’re not going to jump into something unadvised,” added commissioner Scott Walls. Taking a queue from other counties, the commissioners have filed a one-year extension with the state Department of State so they have time to research what they can do to purchase machines with the help of Southern Alleghenies Planning and Development Commission. Though Gov. Tom Wolf has promised $15 million a year in funding to replace voting machines for the next five years, when split down to the 67 counties, commissioners say that won’t be enough to cover the approximately $500,000 the county would need to invest in replacing the voting machines. That money is in addition to the $14.15 million that has been promised by Wolf in state and federal funding. Commissioner Jeff Thomas did say, however, if they’re not granted any kind of extension, they are working toward something where they will purchase new voting machines to be in compliance. “If we have to, we will do whatever is necessary,” he said. But, if legislation introduced by Irvin takes off, Huntingdon County may have a little more time to formulate a plan to purchase new voting machines. House Bill 864, introduced by Irvin this week, would exempt existing systems that comply with the Department of Homeland Security’s call for verifiable ballot voting systems while giving counties a reasonable four-year timeframe to properly update their voting systems. He was inspired to draft this legislation based on the county’s plight with the mandate to purchase new machines. Irvin said legislation is specifically focused on 17 counties that have voting machines with a paper ballot, but aren’t up to the current state Department of State standards. “This gives the option to push back requirements at least four years to give counties an opportunity to budget better for it,” he said. He also remembers when the current voting machines were purchased 10 years ago, having been county treasurer at the time. “I know we had funding come down with the Help America Vote Act, and the counties had options to pick various types of machines,” said Irvin. “I know that Huntingdon County was comfortable with having a paper ballot. “Now, we’re penalizing counties that do meet the accountability standards for the U.S. Department of Homeland Security,” he added. Irvin does admit the current machines don’t have as many updates as new machines would; however, he emphasized the point commissioners have made that the machines have only been used 20 times since they were purchased 10 years ago. Additionally, Irvin also understands the current machines are an independent system, so they’re not tied to a larger network. “From what I understand, you have to transfer data through a zip drive to a computer to put the results (of the machine) into the system, then it updates on the county’s website,” he said. While he’s not sure if the bill will get any movement, Irvin’s hopeful it can eventually get to the governor’s desk to sign. Five-year-old Jurnee Brown enjoyed the swings at Portstown Park in Huntingdon Borough for the first day of spring. Though the weather is expected to be colder than normal for the end of the week, overall temperatures will trend warmer than normal into the first weeks of April. Though the first day of spring was greeted with average temperatures and partly sunny skies, remnants of winter aren’t expected to leave just yet, at least for the next few days. However, in the longer-term forecast, things will pick back up and trend above normal after the weekend. Matt Steinbugl, meteorologist with the National Weather Service bureau in State College, gave a rundown of the forecast through the end of the month. In addition to the below-normal temperatures, rain is in the store in the forecast, with some snow expected in parts of the state. According to Steinbugl, the cold front will bring showers in the area and a costal low will develop near Cape Hatteras, and the the low will move north along the mid-Atlantic coast, and the eastern part of the state will have moderate to heavy rain, with wet snow in the higher elevations. However, by Friday, the storm will move through in time for the weekend, where a rebound in temperatures will be felt in the area. “We will see a warming trend as we get late into the weekend and into next week,” he said, saying the temperature trend will continue through the beginning of April, at least. Just as the odds are tilted in favor of warmer-than-average temperatures, the seemingly endless pattern of wet weather will also seem to continue through the first few weeks of spring. “The odds are in favor of above-normal precipitation over the next 14 days or so,” said Steinbugl. “It doesn’t mean it will rain the whole time or it will be considerably dry, but the odds are tilted to wetter than average. Unlike the Midwest, where snowmelt has contributed to the devastating floods in the region, Steinbugl doesn’t see that happening here. Though snow is called for in the forecast in some parts of the state for late week, Steinbugl said as March rolls into April, the chances of snow of any form will diminish greatly. Volunteer cameraman Rufus Brenneman filmed auctioneers Ruth Reinhart, left, and Debbie Higgins Wednesday at the Smithfield Fire Hall as they opened up the first night of the 45th Huntingdon County PRIDE Telethon. The sound of phones ringing ushered in the opening night of the 45th PRIDE Telethon Wednesday at the Smithfield Fire Hall as eager viewers dialed in to bid on a wide array of donated items to benefit Huntingdon County PRIDE. The total amount raised for the first night of Telethon came in at $11,433, which included the $2,080 brought in by the three donated speciality items, a flower arrangement package donated by Vaughn’s Flowers and Gifts, Mount Union, gym equipment donated by a PRIDE friend and a Hoosier cabinet donated by J&M Primitive Country Furniture. “We were very excited to see the speciality items and the auction items go in the same fashion as they do every year,” Pfingstl said. Pfingstl and his PRIDE employees manned the phones as the Telethon went on the air as auctioneers Debbie Higgins and Ruth Reinhart showcased the donated items and opened up the bidding promptly at 4 p.m.
Auctioneers Tosha Simpson and Bill Mills closed out the evening, reaching Table 22 before going off the air at 12:01 a.m.
Other auctioneers throughout the night included OJ Johnston, Jinny Cooper, Mikara Anderson, Brooke Emery, Drew Baker and Becky Weikert Bard. Pfingstl reminds bidders the Smithfield Fire Hall will be open at 9 a.m. today and Friday so that items may be picked up until the Telethon goes off the air. Items may be picked up from 9-11 a.m. Saturday at the fire hall. After 11 a.m. Saturday, the auction items will be packed up and taken to the PRIDE office, where they may be picked up beginning Monday, March 25. The second night of the Telethon will kick off at 4 p.m. today live from the fire hall. The public is welcome to watch the Telethon live or it can be viewed on Comcast channel 17 and online at www.huntingdonpride.org. Tonight’s auction will include three specialty items. A corner cabinet donated by J&M Primitive Country Furniture will be auctioned around 6:30 p.m., a red oak cabinet created by Walter Lawhead will be sold at approximately 8 p.m. and a vacation at Sugar Bush Resort in Warren, Vermont, donated by Bob and Artamarie Barclay, will be up for bid around 9:30 p.m. 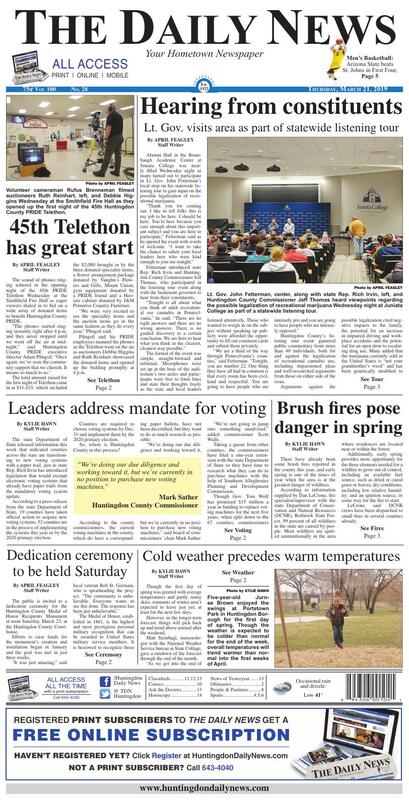 The year’s Telethon will conclude with a talent and dare day Saturday, March 23, set to begin with the first-ever karaoke contest from 10-11 a.m. at the fire hall. 4. A number of community events will be held throughout the week with proceeds benefitting the Telethon. Those interested in donating funds or bidding on auction items can do so by calling 643-5001. The public is invited to a dedication ceremony for the Huntingdon County Medal of Honor Recipients Monument at noon Saturday, March 23, at the Huntingdon County Courthouse. Efforts to raise funds for the monument’s creation and installation began in January and the goal was met in just three weeks. The Medal of Honor, established in 1861, is the highest and most prestigious personal military recognition that can be awarded to United States military service members. It is bestowed to recognize those who have distinguished themselves by acts of valor and is typically presented by the President of the United States. The five honorees recognized on the monument will be Capt. Horace Porter, Pvt. William Reed and Henry C. Warfel, all of whom served in the United States Army during the Civil War, Pvt. William P. Maclay, who served in the United States Army during the Philippine Insurrection (1899-1902), and Sgt. William D. Port, who served in the United States Army during the Vietnam War. Sgt. Port’s Medal of Honor was awarded posthumously. The completed monument, created by Prayer Mountain Monuments, Huntingdon, measures approximately 24 inches wide and 48 inches tall, all created from polished black granite. It was installed on the grounds of the courthouse Wednesday afternoon. Trena Figard will perform the national anthem and local honor guards will preside at the event. A commemorative booklet will be provided to all of those in attendance as supplies last. The event will be moved indoors in the event of inclement conditions. Refreshments following the event will be offered at the Standing Stone VFW Post 1754, Huntingdon. “I just can’t thank the community enough,” he said. Information from the state Department of Conservation and Natural Resources Rothrock District shows the proper way to construct a burn barrel if residents want to burn brush so they’re less likely to cause a wildfire, which is more common in early spring. There have already been some brush fires reported in the county this year, and early spring is one of the times of year when the area is at the greatest danger of wildfires. According to information supplied by Dan LeCrone, fire specialist/supervisor with the state Department of Conservation and Natural Resources (DCNR), Rothrock State Forest, 99 percent of all wildfires in the state are caused by people. Most wildfires are ignited unintentionally in the area where residences are located near or within the forest. Additionally, early spring provides more opportunity for the three elements needed for a wildfire to grow out of control, including an available fuel source, such as dried or cured grass or leaves; dry conditions, including low relative humidity; and an ignition source, or some way for the fire to start. LeCrone said DCNR crews have been dispatched to small fires in several counties already. Despite the fact that conditions have been wet in recent months due to rain and snowfall, LeCrone said wildfires are still a danger. LeCrone said that depending on the area wildfires occur, it may be difficult to move fire apparatus into the area. Folks may want to clear out debris by burning, but LeCrone said DCNR has guidelines for those who want to do so. Some of those guidelines include not burning on windy or dry days, check the fire danger at the local DCNR forest district office, being aware of burn bans in a municipality, burn away from utility lines, overhead limbs, buildings and other flammable items, keep the area small, maintain a clear area devoid of vegetation at least 10 feet around a burn area, keep a water source on hand as well as a rake and shovel and never leave a fire unattended. LeCrone also said that using alternatives to outdoor burning like composting, recycling or chipping woody materials is always an option. Those who cause wildfires are also responsible for the cost of extinguishing one.